If you have read the White Potatoes for Baby Food page on the main WBF website, you know that I am not a big fan of feeding younger babies this little spud. I think it’s important to offer up foods that have the most nutritional bang, especially for those little ones between (4)6-8 months of age. 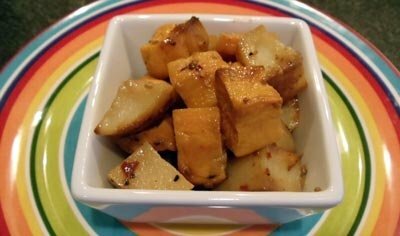 While white potatoes are not completely without any redeeming nutritional value, they are not a great “staple” baby food like sweet potatoes/yams are. The other night I was short on white potatoes for a roasted potato dish I was making. I decided to use up the 2 lonely sweet potatoes that were sitting in the spud bin and getting ready to pass their prime. The roasted potato dish that resulted was really more amazing that I thought it would be! This recipe would be suitable for babies 8 months+ who are enjoying texture, herbs, spices and onions too. You could always give the potatoes a whizz and turn this into a puree if you wish. Step 2: Wash and scrub the potatoes – peeling is optional but please peel the potatoes if you plan to serve this to your little ones for finger food. Step 5: Stir in the minced garlic. Step 6: Sprinkle on the herbs and spices and stir to combine. For baby: Top with plain whole milk yogurt or add in some shredded meats, peas, peaches….